Craft of hand block printing is a very old art used to print clothes using vegetable colors with the help of wooden or metal blocks. A statue wearing the hand block printed scarf found on the site of "Mohe-Jo-Daro" traces the history of craft of hand block printing done in that place some 4000 years ago. In Indian sub-continent its origin or birth place is considered to be the Sindh province of today's Pakistan. ""Khatri"or "Chhippa"community mainly involved in the craft of hand block printing in this region since many centuries and later migrated to Gujarat and other parts of India to promote their craft and also in search of new regions to expand their business. In Rajasthan and some parts of Madhya Pradesh "Chippa" Community traces their roots with the "Sant Namdev" a devotional saint of 13th century and tailor by profession. This "Chippa" community consider themselves a descendant of Saint Namdev. Even today Bagh village and Tarapur villages in Madhya Pradesh, Kutch region of Gujarat, various towns and villages in Rajasthan, in India are the major centers where craft of traditional hand block printing is practiced using the the traditional process it was practiced 400 to 1000 years ago with some minor changes. Traditionally vegetable colors were used in printing and dyeing of fabrics. Today there are many urban and rural centers of hand block printing chemical colors, direct colors and pigments used for printing and chemical dyes introduced. But the use of all these chemical colors not only polluting the sources of clean water but also not good for skin. Few researches suggested that most of the chemical dyes are unsafe for our skin and gave birth to many skin related diseases. Still there are few centers left in India where traditional process and vegetable colors used in printing and dyeing. 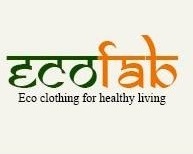 Today EcoFab is promoting traditional craft of hand block printing by emphasizing more on using natural/herbal dyes and eco-friendly colors in the process. Traditionally varieties of cotton and silk fabrics used in hand block printing industry but other natural fiber based fabrics like modal and viscose fabrics are also used in printing.